This is Amit from Mumbai. 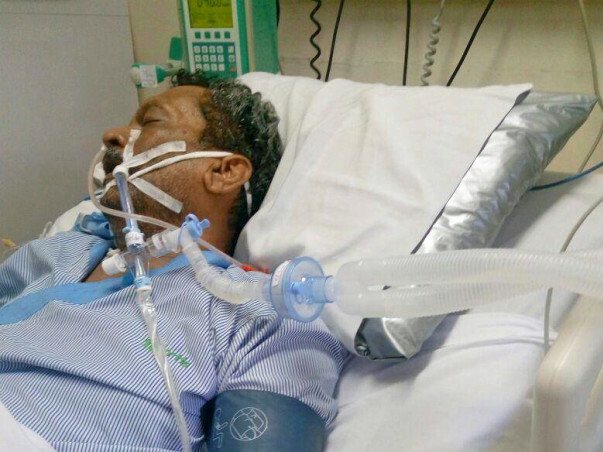 My father was admitted in hospital during 20th-26th Dec 2016 due to his heart problem. He was admitted due to extreme stomach pain on 30th Dec 2016 (just 4 days after discharge). He was diagnosed with gallstones on 31st Dec night in citi scan. 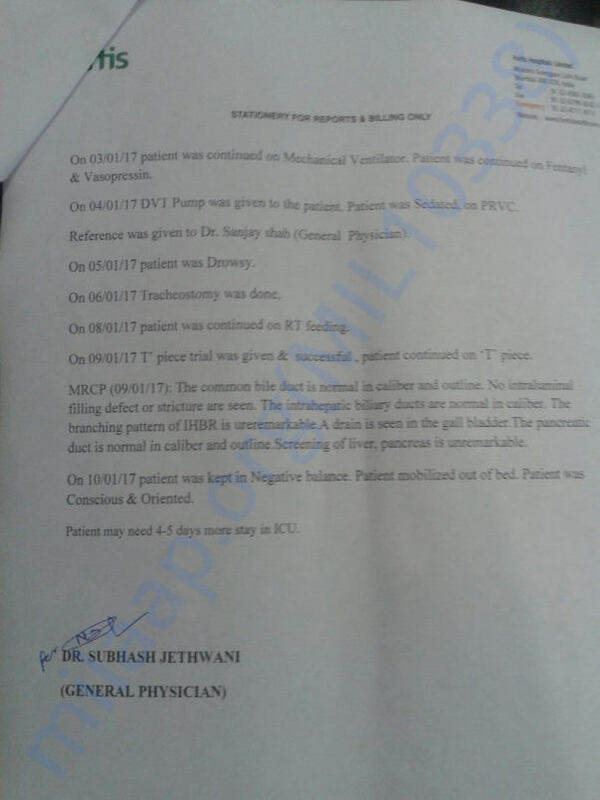 From 30th Dec upto 1st Jan (3days) his health completely deteriorated due to late diagnosis & poor knowledge of doctor. Meanwhile the infection due to gallstones spread into blood & temporarily damaged internal organs. We then shifted him to another hospital where he was put into ICU with ventilator. Now his health is improving. 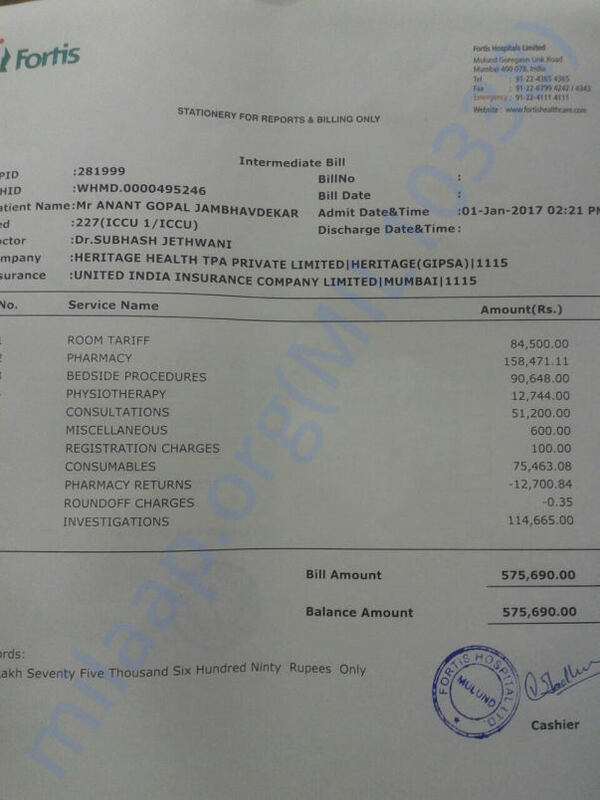 Till 9th Jan, the hospital bill is 5.03L & still he have to undergo surgery. We are from middle class Maharashtrian family & can not afford so much of sudden expense. 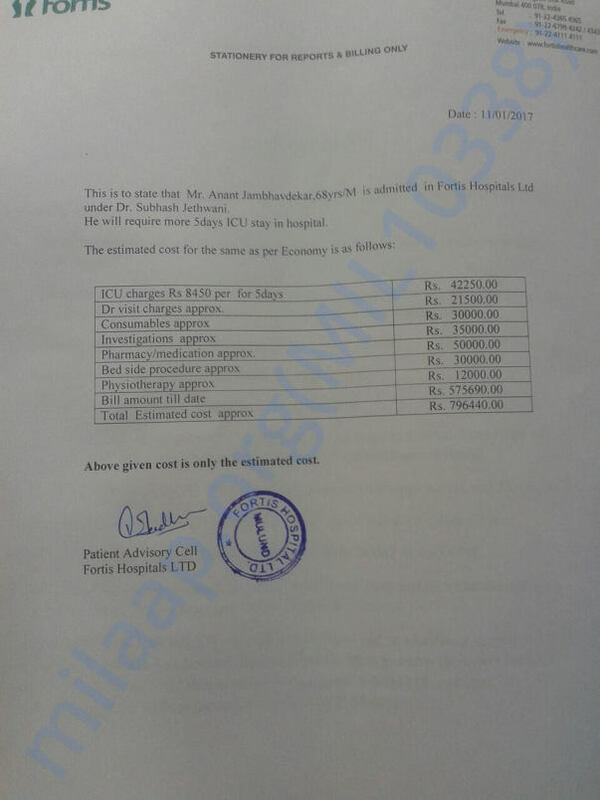 During his earlier hospitalization we already spent money. It would be really greatful if you could help us in terms of finance. 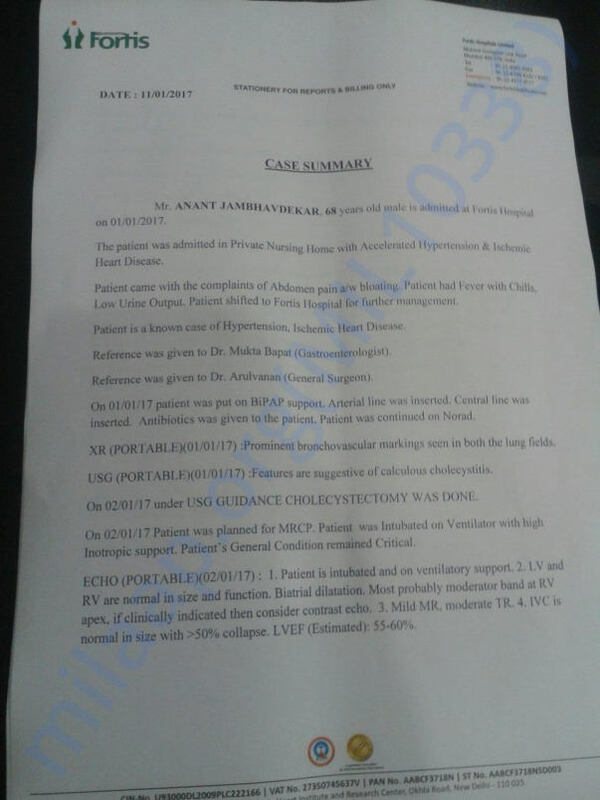 I am attching herewith the case summary & some documents by Hospital..
A heartily thanks to all of you who helped me in my difficult time. I can not express your help in words. However I will definitely remember your love & shall also be reachable in case of any need. Currently my father got discharged from hospital to heal his internal body part damage. Recently we had his tests like USG, LFT & other blood tests. His Liver tests are abnormal but other tests results are within range. Doctor might schedule his surgery in next week (i.e. any day between 13th-18th feb 2017). Since his condition was critical, doctor has advised us not to hurry about surgery; however surgery would be integral part of process. They might remove gallbladder. Again, a big thanks to all of you, Milaap & everyone who helped me. This is a simple thanking message for all your help. Also, I would like to request anonymous donors, please mail / text me your identity. Thats because I would really like to be in touch with you all for repayment. Please do not take me wrong. I should have posted this note in my main message itself, however I have recently added it to the bottom of my message & I am really feeling sorry for it. Its humble request from my side. Again, please do not misunderstand & text me back with your identity. I will be really happy to see all these anonymous friends in my inbox. Do not hesitate & consider this as my deep request please. First of all a big heartily thanks to all of you for your support. It's not only the amount but your presence in the form of messages that is really supporting me & my family a lot ! 5. Basic exercise like moving hands, walking for 4-5 feet is carried out under observation of General Physician. Currently surgery is on hold due to his extreme weakness. I shall update with doctor's reports again.